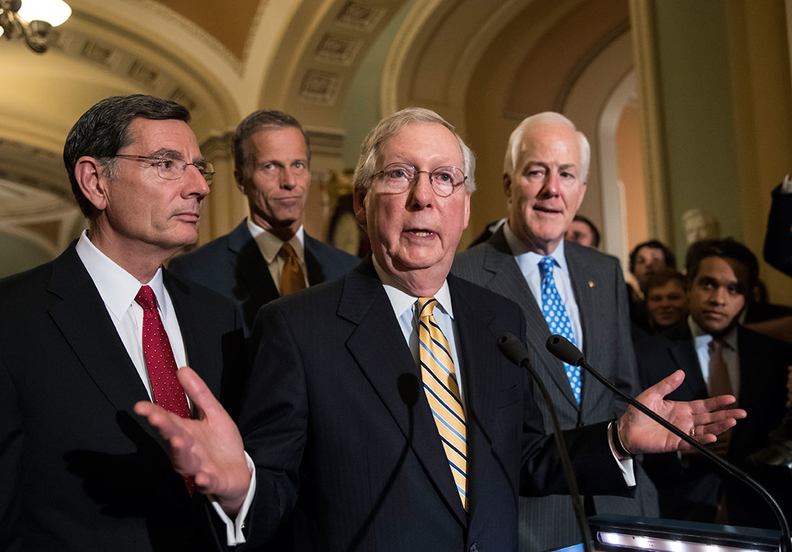 Senate Majority Leader Mitch McConnell of Ky., joined by, from left, Sen. John Barrasso, R-Wyo., Sen. John Thune, R-S.D., and Senate Majority Whip John Cornyn of Texas, speaks with reporters on Capitol Hill in Washington. To the alarm of healthcare industry groups, Senate Republican leaders appear increasingly likely to include a repeal of the Affordable Care Act's individual mandate in their tax overhaul legislation, giving them the chance to cut taxes by a larger amount. "We're optimistic that inserting the individual mandate repeal would be helpful and that's obviously the view of the Senate Finance Committee Republicans as well," Senate Majority Leader Mitch McConnell (R-Ky.) said Tuesday. Sen. John Thune (R-S.D.) told Politico he had checked with other Senate Republicans and he is confident repeal of the mandate as part of the tax plan could win the needed 50 GOP votes to pass under budget reconciliation rules that would prevent a Democratic filibuster. Senate and House Republicans are scrambling to find ways to sharply cut corporate and individual taxes without exceeding their self-imposed cap of increasing the federal deficit by $1.5 trillion over 10 years. But the two chambers differ over whether to eliminate or keep personal deductions, such as the home mortgage interest deduction and the deduction for state and local tax payments. President Donald Trump has urged them to include repealing the mandate in the tax bill because it would kill two birds with one stone—abolishing a cornerstone of Obamacare and giving Republicans more leeway in cutting taxes. If Republicans repeal the ACA's tax penalty on households that don't obtain health insurance as part of the tax bill, that would give them $338 billion in cost savings over 10 years to soften the bill's rollback of popular tax breaks, according to the Congressional Budget Office. On the flip side, repealing the mandate penalty would result in 13 million fewer Americans with health insurance in 2027. In addition, average premiums in the individual market would increase 10% more annually than if the mandate were preserved. Those effects would occur, the CBO said, because healthier people would be less likely to buy insurance without the law's tax penalty for not being covered, and because the premium increases arising from the sicker enrolled population would lead fewer people to buy. Six major healthcare trade groups urged congressional GOP leaders Tuesday to preserve the ACA's individual mandate. They included the American Hospital Association, America's Health Insurance Plans, the Federation of American Hospitals, the Blue Cross and Blue Shield Association, the American Medical Association, and the American Academy of Family Physicians. Insurers and many health policy experts say the mandate penalty is important in getting younger and healthier people to buy insurance, and their presence in the market helps offsets the cost of older and sicker enrollees, keeping premiums in check. They warn that eliminating the mandate without replacing it with some other strong mechanism to give people an incentive to maintain continuous coverage could quickly unravel the already shaky individual insurance market. "You need some way to incentivize people to become insured," said Gail Wilensky, a senior fellow at Project Hope who headed the Medicare program under President George H.W. Bush. "Otherwise you'll only exacerbate the problem of adverse risk selection." "We want to make sure there is either a carrot or a stick that is efficient enough to get people to enroll," said Margaret Murray, CEO of the Association for Community Affiliated Plans, which represents safety-net insurers. "We would be open to other suggestions, but when we looked at it, the mandate seems the most effective way." It remains to be seen if Senate Republicans who opposed previous efforts to repeal and replace the ACA, including Sens. Susan Collins, Lisa Murkowski, and John McCain, will back the mandate repeal as part of the tax plan, particularly since it would cause big coverage losses. "My concern is that if we combine the healthcare issues with tax reform, we make it far more controversial," Collins told Politico. But Wilensky said repealing the mandate as part of the tax bill may be politically easier for the Senate GOP holdouts than supporting earlier repeal-and-replace bills, which included large cuts in Medicaid and repeal of Medicaid expansion. "This is less politically toxic than taking so much money out of Medicaid," she said. In another development Tuesday, the CBO indicated that passage of a tax plan that increased the deficit by $1.5 trillion over 10 years would require the Office of Management and Budget to sequester about $111 billion in Medicare funding to offset the loss in revenue from the tax cuts. That information, contained in a letter to senior House Democrat Steny Hoyer (D-Md. ), could spark new opposition to the tax bill from the healthcare industry and Medicare advocacy groups.